Directions: 30484 Icon Rd, Maryville, MO. From Business 71 in Maryville, take Hwy V west to Icon Road. Go south on Icon Road for 3 miles! What: Lettuce Dream will be hosting our fundraising event the "Bacon Lettuce Tomato Festival". 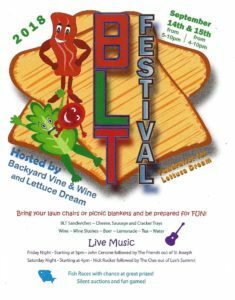 This event will be held with live music, fish races, local wines, a silent auction, and of course, BLTs! Bring your lawn chairs or picnic blankets and be prepared for fun! You can donate to the cause here!